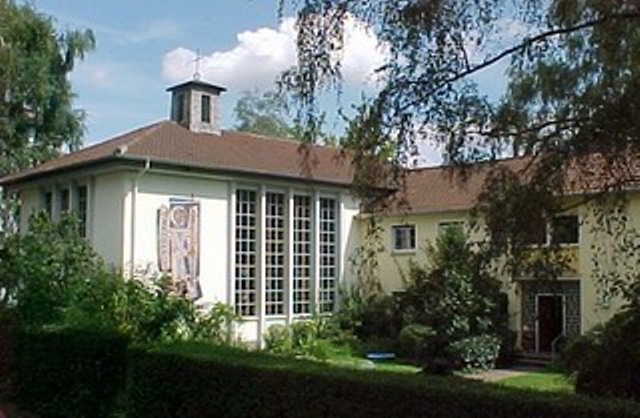 In 1985, Lutherans in the Kaiserslautern Military Community (KMC) wanted a more “civilian” parish, and Kaiserslautern Evangelical Lutheran Church (KELC) was founded on Easter Sunday. The Lutheran Church in America (LCA) and the American Lutheran Church (ALC) were both asked to sponsor the parish, but declined because they were then in the process of merging into the Evangelical Lutheran Church in America (ELCA). The Lutheran Church Missouri Synod (LCMS) then agreed to sponsor the parish, and help it financially. The parish agreed to call LCMS clergy as pastors. At first the congregation was made up of military families and Department of Defense employees in the KMC. The first pastors were Army Lutheran Chaplains (one LCA and one LCMS) stationed in the area. In the fall of 1987 the congregation extended its first pastoral call to retired Air Force Chaplain Glenn Koch and his wife Martina. The congregation flourished under the Kochs’ ministry, assisted with strong lay leadership. After a year worshiping in a rented building, it was decided to build a church. The LCMS was approached for financial aid and the congregation received a commitment of $1 million to help in buying land and building a suitable church. A site near the A6 Autobahn exit for Landstuhl was purchased for DM 385,000. The congregation began worshipping at St. Michaelis while awaiting the completion of their new building. At this time the parsonage was also moved from Enkenbach-Alsenborn to its present location. At this point Pastor Koch fell ill and had to resign, to return to the US in the winter of 1988. Through the LCMS Board for Mission Services, a call was extended to Pastor James Hoke and his wife, Linda and daughter, Wendy. Pastor Hoke celebrated communion in the parsonage on Maundy Thursday, 1989. The congregation numbered about 75 people then, and would grow to over 125 by November 1989. Then the Berlin Wall fell, and the military drawdown over the following year cut the KELC membership in half. In view of the shrinking American population in KMC, the decision was made in July 1990 to sell the property in Landstuhl and remain worshipping at St. Michaelis in Kaiserslautern. On 14 August 1990, Pastor Hoke sold the Landstuhl property, on behalf of KELC, for DM 500,000. A McDonald’s now occupies the site. The military drawdown finally halted in 1994, and the congregation stabilized at approximately 30 members. Despite her size KELC remains a beacon of the Orthodox Lutheran faith in the KMC, and serves as a gathering place where God’s Word and Sacraments and Luther’s pure doctrine are preached and practiced.